Where Is Our Innovation Advantage? The president called this period in American history another "Sputnik moment," invoking the government's long tradition in guiding tech breakthroughs, from the microchip to the jumbo jet. The next stage in American innovation, he suggested, will be green energy. It's easy to see why. The demand for energy will increase dramatically in the next few decades across the globe, and old fossil fuel power is scarce, expensive and environmentally harmful. The future demonstrates an obvious demand for new, clean power, and the world's most advanced countries should be racing to provide supply. Of the 500 or so words Obama dedicated to innovation in his State of the Union, 360 dealt with clean energy. But that's just talk. The United States government provides only 20 percent of the OECD's energy R&D spending. On the other hand, we make up 70 percent of the developed world's bioscience and medicine research spending, as economist Michael Mandel writes. "The truth of the matter is the US in the last 10 years has put its R&D money into information technology and biosciences," Mandel told me in a previous interview. "That's really it. We have not really put it into energy." And Mandel says that's not a terrible thing. Let China keep its lead in solar and alternative energy manufacturing. "We need a biosciences revolution because it's a direct attack on our biggest problem, which is tremendous amount of resources sucked up by health care," he said. "Imagine if we had a pill to deal with Alzheimer's patients. Now those bodies are freed up to do other things. And those costs are freed up. That drives growth across the entire economy." Here's the rub: The drug industry's research productivity has been declining for 15 years, as the New York Times reported. Research spending by large drug makers has nearly tripled since the early 1990s, but new drugs approved by the FDA have fallen by 50 percent since 1996. 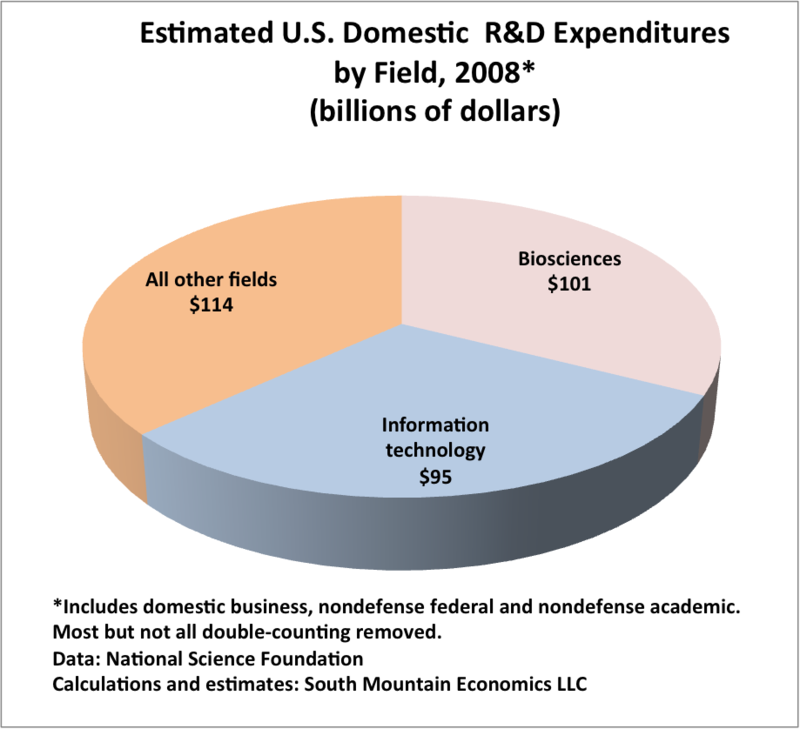 So the federal government is responding with ... yes, more R&D assistance. The White House has plans to start a billion-dollar "government drug development center" to reverse the two-decade slide in drug roll-outs. That's the dark side of Washington betting on winners and losers. Sometimes we get the Internet, and sometimes the government's winners turn out to be losers. It doesn't mean the U.S. should necessarily get out of the innovation business. It means that an innovation economy is both a choice and a bet.